A while back, I wrote this post on How to Re-Season an Old, Worn Piece of Cast Iron. I got lots of comments on how to clean cast iron. Which is totes awesome, except it wasn’t a post on how to clean cast iron. But this is. 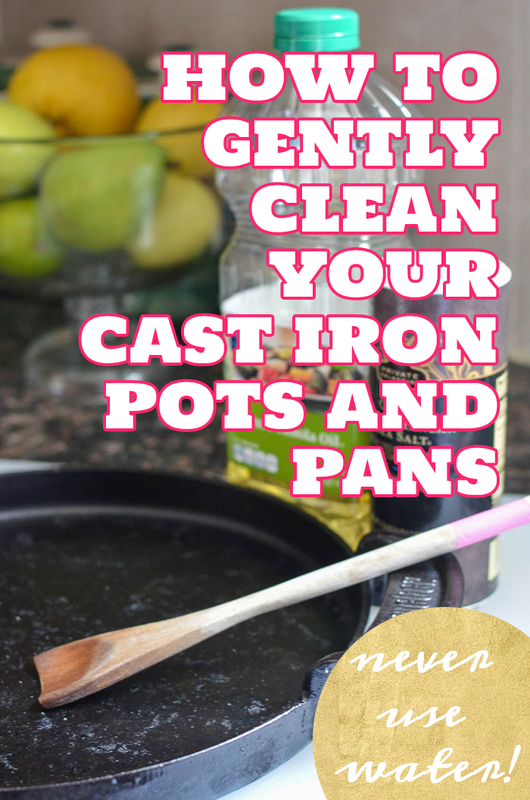 This is a post on how to gently clean your cast iron pots and pans. Notice, I put in the word “gently” to make sure everyone knows I’m all about loving up on my cast iron and keeping it safe as a baby egg in a high-school science project where you have to drop that sucker from a one-story building without it breaking face all over the sidewalk. This is how you do it. Complete with animated photos for your how to gently clean cast iron pots and pans viewing pleasure. First take your gentle scraper that I showed you how to make a few days ago. Then, once you finish scraping the big bits off , pour some oil into the pan. Rub the oil around with a paper towel. If you need to, take your gentle scraper back to it and gently scrape the pan a bit more. Gently, got it? Then, if you still need a little more gentle abrasive action, pour in some coarse sea salt and gently rub it around with a soft sponge or a paper towel. 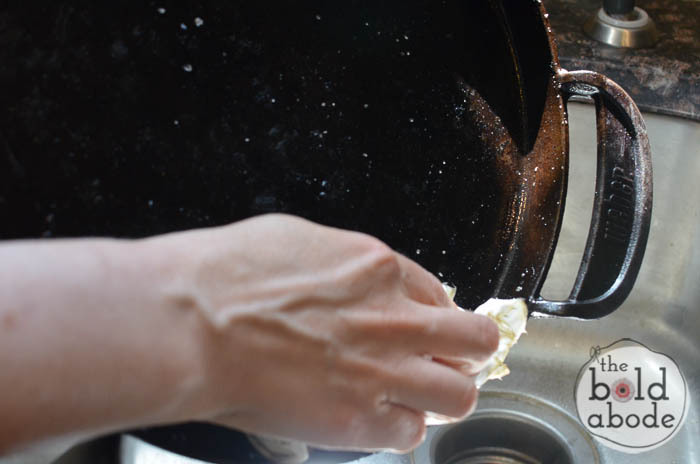 Once you are satisfied with the cleanliness of you pot or pan, take another paper towel and, tilting the pan over the sink, brush out all the grody bits and salt. Finally, take a clean paper towel and buff your pan. You can add a bit more oil if you want. If you’re not into paper towels, you can use a soft, lint-free cloth. You have choices here. I’m all about the freedom of the choice. So, there you have it. You might notice there are still some bits left on the pan. I like to call that “seasoning”. Seasoning is good for your pan. Are you into paper towels like I am? Or do you prefer the more environmentally sustainable cloth that is soft? 3 Creative Storage Solutions, baby! Any tips on cleaning a cast iron grill pan? I love it, but can’t clean it properly and I don’t want to use steel wool. You can try the tips in this post, Karen. Or, better yet, check with your grill’s manufacturer for directions! That’s always a good idea! oh, wow–no water!? I knew no soap, but not no water–good to know–I’ll have to try this! That’s what they say, Gretchen… but sometimes, I can’t help myself. Shhhh… don’t tell anyone! Very cool! I live the videos too. Very thorough! Thank you! I’m so glad to hear! I’d say it’s worth a try, Ila. But I’ve never had one quite like that. Cast iron holds up really well, so go for it. It certainly can’t hurt it, I think. Thanks, Tricia! It works great… especially with the sea salt!